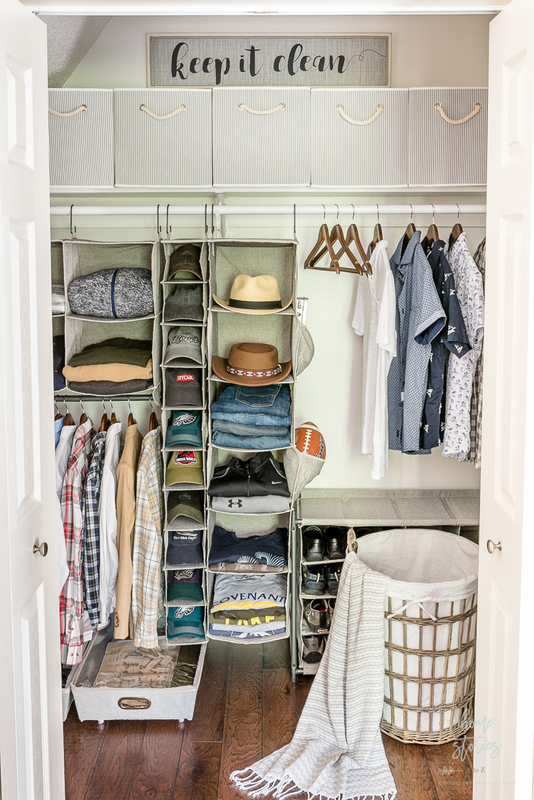 Tackle that messy closet with confidence using these affordable hanging closet organizers! It has officially been one year since we packed our bags in Pennsylvania and moved into our new home in South Carolina! 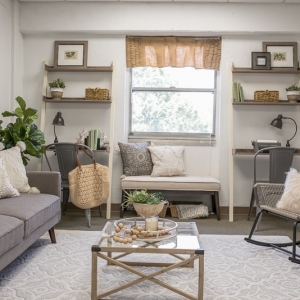 One of the greatest challenges in any move is relearning how to best live life in your new space. Our old home had closets and storage galore with custom built shelving that I designed. Our new house has a shocking lack of storage space and mismanaged closet real estate. 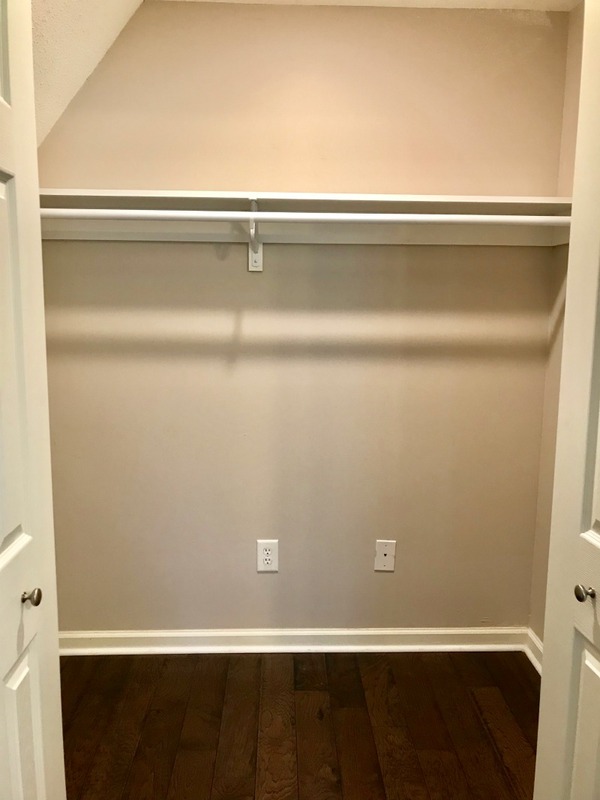 Next, I gave the closet a fresh coat of white paint to brighten things up. 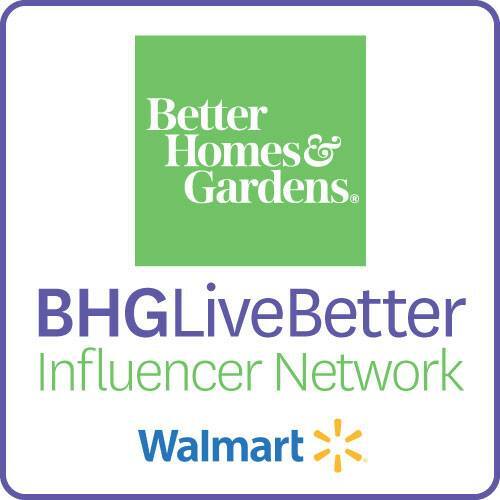 I then headed to Walmart to see which Better Homes & Gardens products might work for our organization needs. 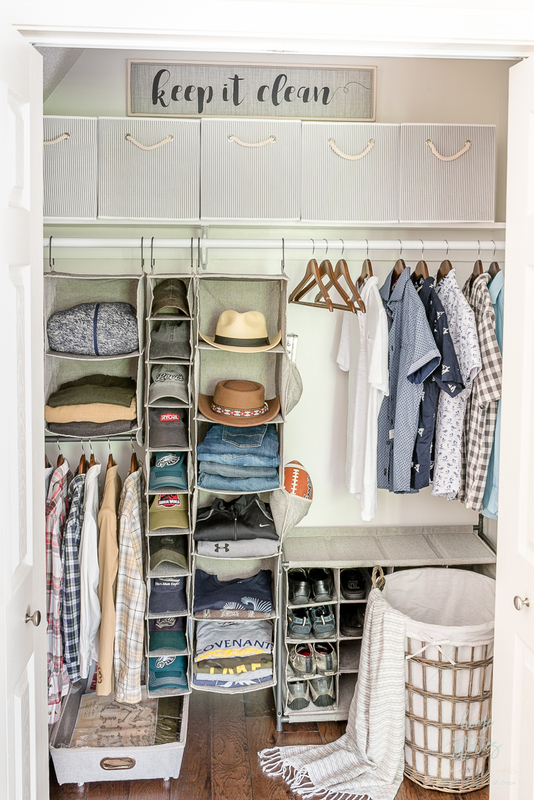 Since the closet is so large and deep, I had originally considered ripping out the inadequate bar and shelf; however, when I saw the Better Homes & Gardens Charleston line of gray closet organizers I knew that wouldn’t be necessary! 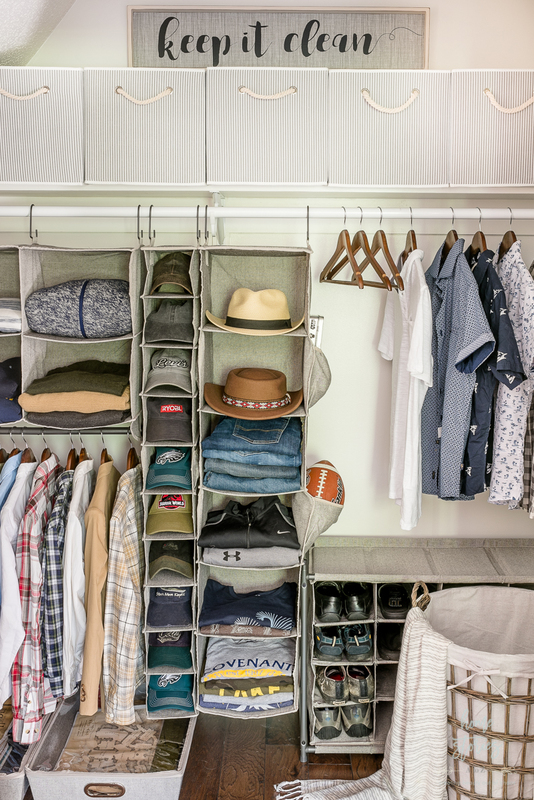 These hanging organizers are great for maximizing your closet space using your existing closet hardware. If you have college kids starting back soon, I think they would be absolutely perfect for a dorm closet! 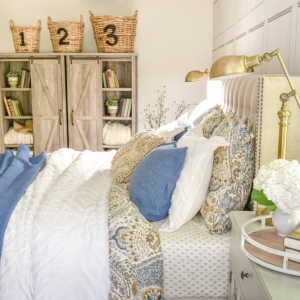 On the top shelf, I used Grey Stripe Storage Bins to store sweatshirts, extra bedding, and blankets. I also made a none-too-subtle Keep it Clean sign as a bossy (but cute!) reminder to my boys.  Here’s hoping it works! 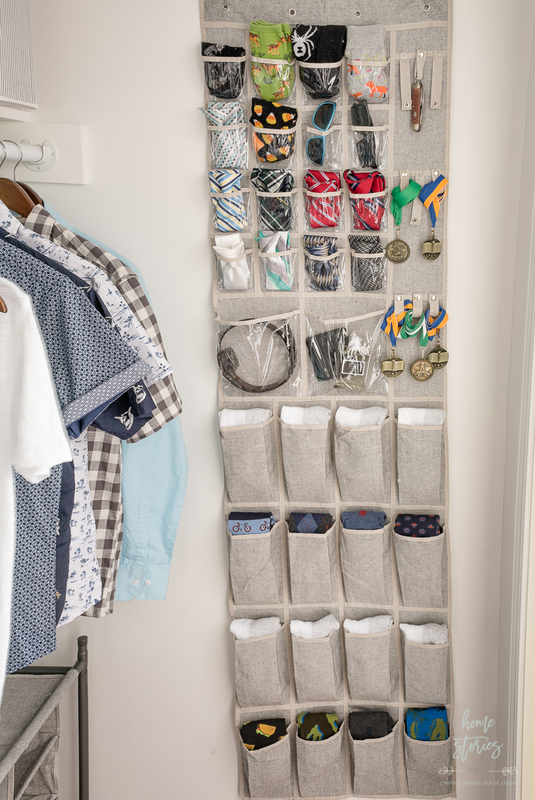 My boys each have their own large dresser where they keep most of their clothing, so these hanging organizers keep items tidy that shouldn’t be stuffed in a dresser. Again, a mother can hope. If the clothing in the closet looks a bit sparse right now, it is! While cleaning out their closet and dressers, I made the boys try on every single piece of clothing they swore still fit and discovered that indeed most of the clothes did not! They have both grown tremendously since last year, so it looks like we will be doing quite a bit of back to school shopping soon. 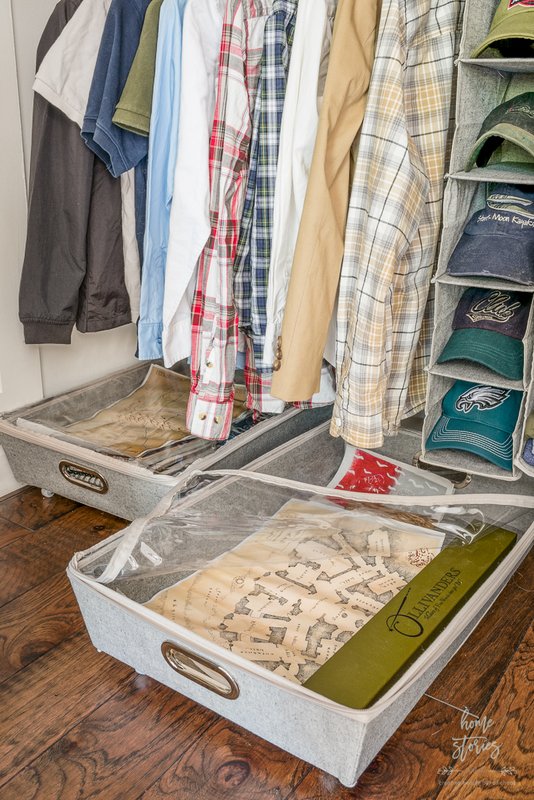 Have you seen these rolling storage organizers before? They are typically used to store sweaters or non-seasonal clothing under the bed. I used two of the Rolling Underbed Storage Organizers to store the boys’ artwork and sentimental keepsakes! These items never had a good home before, so I’m thrilled to have found these. When my boys bring home a piece of artwork from art class or want to keep a special card from a friend, they now have a special and secure place to store their keepsakes. Both the Grey 10 Shelf Closet Organizer and the Grey 6 Shelf Organizer come with storage pockets on the sides! I used the 10 shelf organizer to store their ball caps which previously were cluttering up the mudroom and constantly getting crushed on hooks. I used the 4 Shelf Organizer to store some sweaters and my youngest’s hanging items. 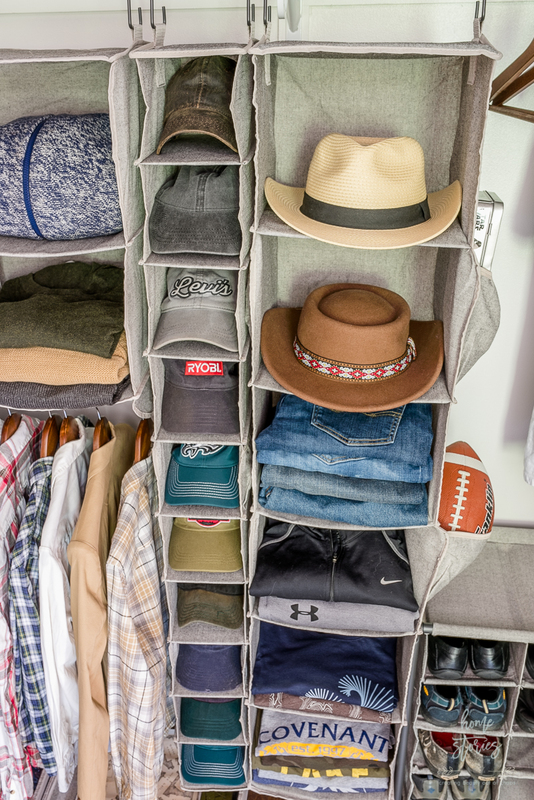 This organizer is perfect for shorter items and shorter members of the family! My boys grow out of shoes so fast that I honestly don’t buy them very many pairs at one time! But somehow our mudroom still becomes cluttered with water shoes, sneakers, and dress shoes. 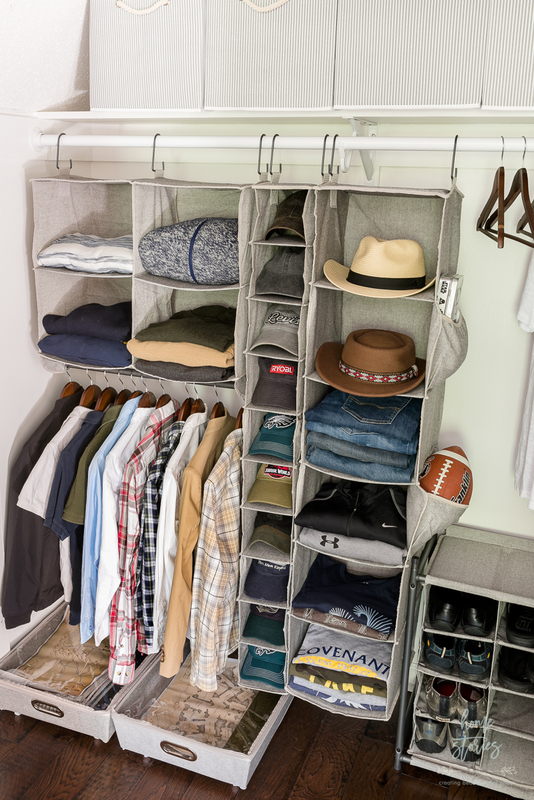 The Gunmetal Grey 16 Pair Stackable Shoe Rack should solve this problem! 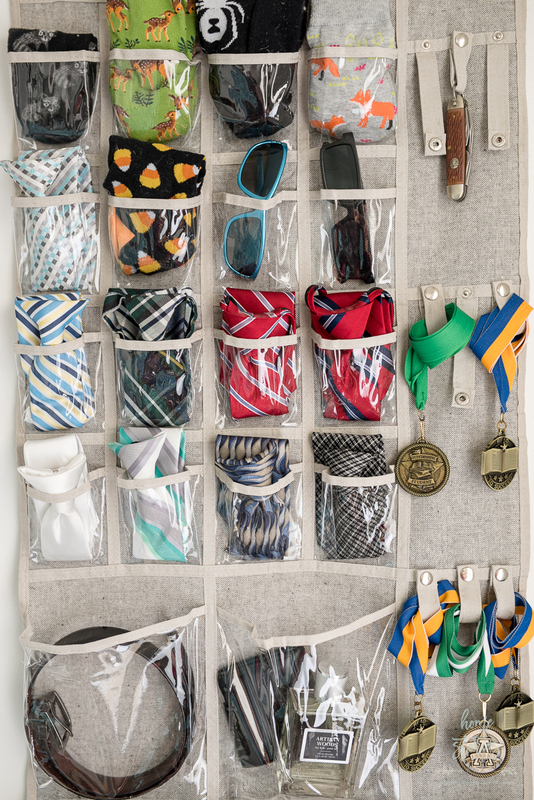 On the sidewall of the closet, I used the Grey Over the Door Hanging Accessory Organizer to store the boys’ ties and accessories. Since the closet doors are bifold, I used hooks in the wall to hang the organizer and it works great! I love the ingenious snap clips and think they’d be perfect for bracelets, hair ties, or necklaces! My oldest wanted to use them to display his recent academic achievement medals which makes me smile. It’s always nice to have some self-esteem reminders when you’re getting ready for the day! You can shop this post by clicking on the pictures below which interest you! Do me a favor and pin this post for later! This turned out so awesome! We would love for you to come link up on our new party Wall to Wall DIY over at R&R at home! I love how it turned out. So functional and it looks amazing.